On the last day of 2013, the federal district court for the Southern District of New York handed the Obama Administration a sweeping endorsement of the NSA’s bulk telephony metadata collection program. Unlike the decision in Klayman v. Obama, the district court in ACLU V. Clapper began with the terrorist attacks of 9/11 to frame the power of the government to defend national security. The Government learned from its mistake and adapted to confront a new enemy: a terror network capable of orchestrating attacks across the world. It launched a number of counter-measures, including a bulk telephony metadata collection program—a wide net that could find and isolate gossamer contacts among suspected terrorists in an ocean of seemingly disconnected data. Unlike the Klayman decision, this opinion relies not upon the search and seizure doctrines of Smith v. Maryland, 442 U.S. 745 (1979) as the distinct powers of the government to conduct foreign and domestic security in United States v. U.S. Dist. Court for East. Dist. of Mich., 407 U.S. 297 (1972). The court quoted a recent decision interpreting Keith to provide for wide latitude in reviewing surveillance powers. Although the Keith opinion expressly disclaimed any ruling ‘on the scope of the President’s surveillance power with respect to the activities of foreign powers,’ it implicitly suggested that a special framework for foreign intelligence surveillance might be constitutionally permissible. Clapper v. Amnesty Int’l USA, 133 S. Ct. 1138, 1143 (2013) (quoting Keith. 407 U.S. at 322– 23) (internal citations omitted). In September 2009, NSA discovered that an al-Qaeda-associated terrorist in Pakistan was in contact with an unknown person in the United States about efforts to perfect a recipe for explosives. NSA immediately notified the FBI, which investigated and identified the al-Qaeda contact as Colorado-based Najibullah Zazi. The NSA and FBI worked together to identify other terrorist links. The FBI executed search warrants and found bomb-making components in backpacks. Zazi confessed to conspiring to bomb the New York subway system. Through a section 215 order, NSA was able to provide a previously unknown number of one of the co­conspirators—Adis Medunjanin. In January 2009, while monitoring an extremist in Yemen with ties to al- Qaeda, the NSA discovered a connection with Khalid Oazzani in Kansas City. NSA immediately notified the FBI, which discovered a nascent plot to attack the New York Stock Exchange. Using a section 215 order, NSA queried telephony metadata to identify potential connections. Three defendants were convicted of terrorism offenses. In October 2009, while monitoring an al-Qaeda affiliated terrorist, the NSA discovered that David Headley was working on a plot to bomb a Danish newspaper office that had published cartoons depicting the Prophet Mohammed. He later confessed to personally conducting surveillance of the Danish newspaper office. He was also charged with supporting terrorism based on his involvement in the planning and reconnaissance for the 2008 hotel attack in Mumbai. Information obtained through section 215 orders was utilized in tandem with the FBI to establish Headley’s foreign ties and put them in context with U.S. based planning efforts. These successes are helpful to begin to understand the program. They do not, however, provide context into the efforts of anti-terrorist activities or explain whether a more focused program would provide equal or greater protections without affecting millions of individuals who have a right to be free from data searching. Or perhaps the Clapper court is correct that national security is different from criminal investigations and more needs to be done to codify the distinction articulated in Keith. The constitutional question remains what his reasonable under the circumstances. Neither decision has been able to answer that question because too much information and power is left to the discretion of the executive branch and secret proceedings. Investigations need to be clandestine, but there is no reason that the nature of constitutional protections is not fully understood and debated. I do not know if the geographic location of the court is relevant, but the shape and culture of lower Manhattan has been transformed by 9/11 in a manner that makes it part of its zeitgeist. Having by coincidence visited the site of the 9/11 memorial with my family the day the Clapper decision was handed down, I was overwhelmed by the thousands of visitors who spoke all languages and came from towns across the world to remember and reflect. The meaning of reasonable takes on different aspects in the shadow of such history. Whether it should do so must also be part of our national debate. The tension between Klayman and Clapper should lead to a healthier understanding regarding terrorism and surveillance, but only if the two starting points of the two decisions can be understood and reconciled. Liberty is protection from oppression. Oppression can come from the government, its enemies, or the unchecked, mob-like will of the majority. Oppression cannot be stopped with more oppression, only with more liberty. Klayman and Clapper cannot be reconciled, but the two decisions have the potential to help us find the right path. The lessons of each decision are best understood as part of a dialogue rather than discrete declarations. That dialogue has only begun. In 1998, Congress amended FISA to allow for orders directing common carriers, public accommodation facilities, storage facilities, and vehicle rental facilities to provide business records to the Government. See Intelligence Authorization Act for Fiscal Year 1999, Pub. L. 105-272, § 602, 112 Stat. 2396, 2410 (1998). These amendments required the Government to make a showing of “specific and articulable facts giving reason to believe that the person to whom the records pertain is a foreign power or an agent of a foreign power.” §602. After the September 11th attacks, Congress expanded the Government’s authority to obtain additional records. See USA PATRIOT Act of 2001, Pub. L. 107-56, § 215, 115 Stat. 272, 287 (2001) (codified as amended at 50 U.S.C. § 1861) (“section 215”).’ Section 215 allows the Government to obtain an order “requiring the production of any tangible things (including books, records, papers, documents, and other items),” eliminating the restrictions on the types of businesses that can be served with such orders and the requirement that the target be a foreign power or their agent. The Government invoked this authority to collect virtually all call detail records or “telephony metadata.” See infra, Part II. See generally David S, Kris, On the Bulk Collection of Tangible Things, 1 Lawfare Res. Pap. Ser. 4 (2013). The Commission making the review was originally constituted at the 9-11 Commission (properly The National Commission on Terrorist Attacks Upon the United States. In 2010, the Commission was reauthorized to serve more broadly on the Intelligence Community readiness. The Commission said the lack of investment, coordination, infrastructure and foresight is putting the nation at risk. U.S. technological superiority is diminishing in important areas, and our adversaries’ investments in [Science and Technology]—along with their theft of our intellectual property, made possible in part by insufficient cyber protection and policies—are giving them new, asymmetric advantages. The United States faces increasing risk from threats against which the IC could have severely limited warning, deterrence, or agility to develop effective countermeasures. The report is not primarily an intelligence report. The Commission was not focused on the failures associated with the NSA massive – and in some cases unconstitutional – spying campaign. Nor was it tied to the Edward Snowden disclosures and the global embarrassment triggered by those disclosures. Instead, the report identifies the need to treat intelligence as a global issue that needs broad reforms, such as STEM education and immigration/workforce reform. It identifies a wide range of concerns about the lack of investment in intelligence and the failure to be prepared. This is just one of many reports highlighting the continued disarray of the intelligence community, an infrastructure struggling to keep up with cyber-threats and embarrassing the U.S. with political follies. Failure to properly appraise the extent of scientific developments in enemy countries may have more immediate and catastrophic consequences than failure in any other field of intelligence. Failure to properly resource and use our own R&D to appraise, exploit, and counter the scientific and technical developments of our adversaries—including both state and non-state actors—may have more immediate and catastrophic consequences than failure in any other field of intelligence. When self-proclaimed whistle blower, Edward Snowden disclosed a PowerPoint presentation allegedly detailing the Prism computer system at the heart of foreign data collection program, he set off a firestorm of debate over the role of clandestine electronic surveillance on individuals outside the United States and the U.S. residents who communicate with them. In the week that has followed, some clarity has emerged. 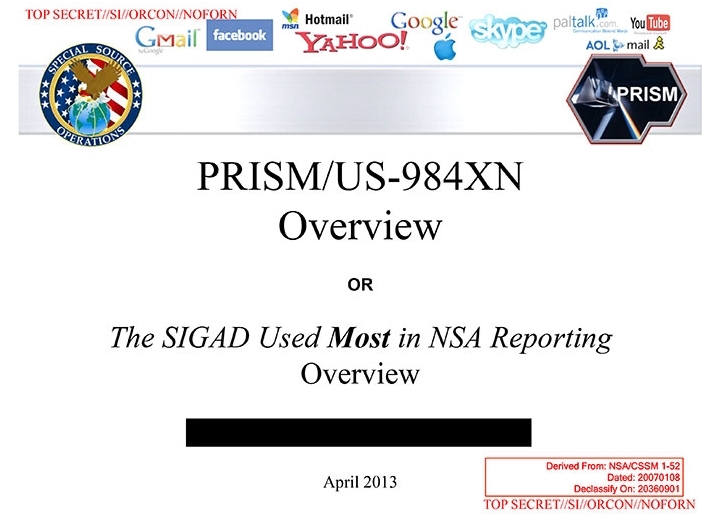 First, the Prism system is not a code name for a clandestine operation, but the name of the computer system used to collect and store the data. According to the Director of National Intelligence, that computer system operates under Section 702 of the Foreign Intelligence Surveillance Act (FISA) (50 U.S.C. § 1881a). Section 702 provides that “the Attorney General and the Director of National Intelligence may authorize jointly, for a period of up to 1 year from the effective date of the authorization, the targeting of persons reasonably believed to be located outside the United States to acquire foreign intelligence information.” The reasonable belief focuses on the location of the target, not the threat posed by the target. Most of the other limitations emphasize that this should not be used if the purpose is to target someone inside the U.S. Nowhere in Section 702 is there a requirement that the information is relevant to an investigation at some level – “specific articulable facts giving reason to believe,” or “reasonable suspicion.” Probable cause is likely not within the realm of possibility. The law allows and even encourages broad, general sweeping of data, which can then be analyzed for patterns and anomalies. The Section 702 directives are the subject of quasi-judicial review. The FISA Court is comprised of 11 federal judges assigned this additional duty by the Chief Justice of the Supreme Court. This internally appointed judicial panel has operated since 1979. In that time, according to the Wall Street Journal, it has rejected 11 applications for various surveillance requests. During that time, the number of approved surveillance requests has been in excess of 33,900 or an approval rate of 99.97 percent. Without knowing anything more, it is inconceivable that any review process with over 99 percent approvals can constitute a meaningful review. Harvard Law Professor and former U.S. District Judge Nancy Gertner highlighted the structural problem of the FISA Court. It’s an anointment process. It’s not a selection process. But you know, it’s not boat rockers. So you have a [federal] bench which is way more conservative than before. This is a subset of that. And it’s a subset of that who are operating under privacy, confidentiality, and national security. To suggest that there is meaningful review it seems to me is an illusion. The problem, therefore, is not a secret or rogue NSA plot but instead a widely supported provision of the Patriot Act designed to be used precisely as the NSA has been doing. It has executive, legislative and judicial support. But because it is operated by a close-knit association, the separation of powers has proven irrelevant as a limitation on its operation. A secret NSA phone wiretapping order was also released last week highlighting the scope of metadata collection within the U.S. under Section 215. Telephony metadata includes comprehensive communications routing information, including but not limited to session identifying information (e.g., originating and terminating telephone number, International Mobile Subscriber Identity (IMSI) number, International Mobile station Equipment Identity (IMEI) number, etc. ), trunk identifier, telephone calling card numbers, and time and duration of call. Telephony metadata does not include the substantive content of any communication, as defined by 18 U.S.C. [Sec.] 2510(8), or the name, address, or financial information of a subscriber or customer. Essentially this means that all of us with Verizon phones can be tracked anywhere in the U.S., our interaction with any other parties triangulated, our First Amendment rights of Association violated, and our notion of privacy eliminated. Non-Verizon subscribers likely are subject to identical orders. There is no reason to doubt that these orders are not routinely issued to track all phone and cell phone movement data. Mary DeRosa summarizes the changes to Section 215 which led to the Verizon court order. Neither the NSA nor the FBI are doing anything other than that approved by Congress. Indeed, were these departments found not to be using the authority granted by Congress, there would be outrage on Capitol Hill. Instead it is the law that has vastly over-extended the government’s reach into the movements and activities of the public, both domestic and foreign. Moreover, the sweep of the law is growing broader by the day as more and more devices and technologies use remote communications to share information. While it might require a warrant to track a vehicle, the Internet enabled Pandora music player, the self-adjusting oil change settings, and the many other connected technologies are not subject to that warrant requirement. The movement of such cars will be routinely swept into the FBI’s database as part of the Section 215 orders. The FTC has initiated a review of the ever-growing “Internet of Things,” which is to mean the “growing connectivity of consumer devices, such as cars, appliances, and medical devices.” Combine the power of the FBI and NSA to order metadata and tracking information on all digital data with the interconnectivity of medical devices, RFID-tagged products, installed devices on vehicles, and smart phone apps, a digital map emerges. Like ants in an ant-farm, every person’s digital trail will be on display before the government. Increasingly sophisticated data analytics will eventually enable the path of each individual ant to be highlighted and sorted from among the swarm. The growing connectivity that has extended the Patriot Act’s reach into more and more aspects of our daily lives require that we revise the laws to reign in the power of government and create a meaningful, statutory right of privacy. These revelations add attention to the problem and highlight the lack of transparency over this tracking. Congress is not shocked at these revelations because they voted to create the programs and have been repeatedly brief on their use. It is the people who have been left in the dark. Given the growth of the programs and the power of the technology they employ, it is time for a more thoughtful, balanced statutory approach. Reddit.com provided the link to the 2002 New York Times article first describing what is now the Prism computer system. See http://www.reddit.com/r/technology/comments/1g3zqz/the_roots_of_prism_a_new_york_times_article_from/. The Northern Kentucky Law Review and Salmon P. Chase College of Law seek submissions for the third annual Law + Informatics Symposium on February 27-28, 2014. The focus of the conference is to provide an interdisciplinary review of issues involving business and industry responses to cyber threats from foreign governments, terrorists, and corporate espionage. The symposium will emphasize the role of the NIST Cybersecurity Framework and industries providing critical infrastructure. Law Review Published Article: The Northern Kentucky Law Review will review, edit and publish papers from the symposium in the 2014 spring symposium issue. Papers are invited from scholars and practitioners across all disciplines related to the program. Please submit a title and abstract (of 500-100 words) or draft paper for works in progress. Abstracts or drafts should be submitted by September 1, 2013. Submissions may be accepted on a rolling basis after that time until all speaking positions are filled. Presentations (without publication) based on Abstracts: For speakers interested in presenting without submitting a publishable article, please submit an abstract of the proposed presentation. Abstracts should be submitted by September 1, 2013. Submissions may be accepted on a rolling basis after that time until all speaking positions are filled. Publication of Corporate Handbook on Cyber Defense: The Law + Informatics Institute may edit and publish a handbook for corporate counsel related to the topics addressed at the symposium. Scholars and practitioners interested in authoring book chapters are invited to submit their interest by September 1, 2013 which may be in addition to (or as an adaptation of) a submitted abstract for The Northern Kentucky Law Review. Submissions may be accepted on a rolling basis after that time until all chapter topics are filled. About the Law and Informatics Institute: The Law + Informatics Institute at Chase College of Law provides a critical interdisciplinary approach to the study, research, scholarship, and practical application of informatics, focusing on the regulation and utilization of information – including its creation, acquisition, aggregation, security, manipulation and exploitation – in the fields of intellectual property law, privacy law, evidence (regulating government and the police), business law, and international law. Through courses, symposia, publications and workshops, the Law + Informatics Institute encourages thoughtful public discourse on the regulation and use of information systems, business innovation, and the development of best business practices regarding the exploitation and effectiveness of the information and data systems in business, health care, media, and entertainment, and the public sector. Perhaps triggered by the New York Times coverage of Google Glass, The FTC announced both a call for submissions and a workshop related to the Internet of Things and its implications on privacy, fair trade practice, and security implications for both data and people. The FTC announcement highlights both the benefits and risks of device connectivity. Connected devices can communicate with consumers, transmit data back to companies, and compile data for third parties such as researchers, healthcare providers, or even other consumers, who can measure how their product usage compares with that of their neighbors. The devices can provide important benefits to consumers: they can handle tasks on a consumer’s behalf, improve efficiency, and enable consumers to control elements of their home or work environment from a distance. At the same time, the data collection and sharing that smart devices and greater connectivity enable, pose privacy and security risks. I have previously described some of these concerns in an article, Mortgaging the Meme. In each of these situations, an automated and consumer-defined relationship will replace the pre-existing activities. In many situations, this will create efficiency and convenience for the consumer, but it will also reduce the opportunities for human interaction and subtly rewrite the engagement between customer and company. Those that understand this change will adjust their technologies to improve the service and increase the customer‘s reliance on its systems. Companies that do not understand how this engagement will occur, risk alienating customers and losing markets quickly. Beyond consumer interactions, other uses may arise. Ethical and privacy concerns regarding misuse tend to focus on government, business and organized crime. These include unwarranted surveillance, profiling, behavioral advertising and target pricing campaigns. As a result, as companies increasingly rely on these tools, they also bear a responsibility to do so in a socially positive manner that increases the public‘s estimation of the company. Public transportation systems designed around real-time usage and traffic patterns. Prescription monitoring to help patients take the right medications at the correct time. Protection of pets and children. Social connectivity, with photo-tagging and group-meeting moving into the real world. Interactive games played on a real-world landscape. There are also law enforcement uses that must be carefully considered. After the Boston Marathon attack, for example, calls for public surveillance will undoubtedly increase, including calls for adding seismic devices and real-time echo-location. Gunshots, explosions, and even loud arguments could become self-reporting. Common household products sometimes become deadly in large quantities. RFID technology could be used to monitor quantity concentration of potentially lethal materials and provide that data to the authorities. The consumer use, public use, and law enforcement use must be thoughtfully reviewed to balance the benefits of the technology with the intrusions into privacy and the legacy of retrievable information that such technology creates. What are the significant developments in services and products that make use of this connectivity (including prevalence and predictions)? What are the various technologies that enable this connectivity (e.g., RFID, barcodes, wired and wireless connections)? What types of companies make up the smart ecosystem? What are the current and future uses of smart technology? How can consumers benefit from the technology? What are the unique privacy and security concerns associated with smart technology and its data? For example, how can companies implement security patching for smart devices? What steps can be taken to prevent smart devices from becoming targets of or vectors for malware or adware? How should privacy risks be weighed against potential societal benefits, such as the ability to generate better data to improve healthcare decision making or to promote energy efficiency? Can and should de-identified data from smart devices be used for these purposes, and if so, under what circumstances? While the FTC has asked some good questions, they are only the beginning. Please submit your thoughts and join the FTC conversation. Jon M. Garon, Mortgaging the Meme: Financing and Managing Disruptive Innovation, 10 NW. J. TECH. & INTELL. PROP. 441 (2012). In President Obama’s 2013 State of the Union Address, the president included announcement of a long-expected Executive Order as well as a Presidential Policy Directive focusing on the need for better cybersecurity coordination and defense. This comes on the heels of a classified National Intelligence Estimate reported first by The Washington Post which “identifies China as the country most aggressively seeking to penetrate the computer systems of American businesses and institutions to gain access to data that could be used for economic gain.” The report ties directly into the focus of the Executive Order, emphasizing the risk both to critical infrastructure and to industry. At the heart of the Executive Order are voluntary efforts on the part of industry and the role of the Federal Government in increasing coordination. “The Cybersecurity Framework shall incorporate voluntary consensus standards and industry best practices to the fullest extent possible.” NIST is authorized to create a preliminary Cybersecurity Framework within 240 days. Compliance incentives will be developed to encourage voluntary compliance. As these standards gain adoption, they will set a new reasonableness standard, pulling the more reluctant companies up because of the risk of negligence and loss. But the real action of the Executive Order is Section 10 which provides that each regulatory agency must report if the agency has the regulatory scope to implement the Cybersecurity Framework. If it does, presumably it will use those regulatory powers to transform the voluntary program into a regulatory one; if it does not, the agency will be expected to engage in the necessary rulemaking to do so. The Executive Order defines critical infrastructure very broadly to mean “systems and assets, whether physical or virtual, so vital to the United States that the incapacity or destruction of such systems and assets would have a debilitating impact on security, national economic security, national public health or safety, or any combination of those matters.” The Policy Directive provides specific guidance to the Office of Homeland Security and to the other federal agencies targeted with enforcing protections of critical infrastructure and regulatory compliance. Report annually on the status of national critical infrastructure efforts as required by statute. When combined with the additional power of regulation across the spectrum of energy, finance, communications, health, agriculture, information technology and other sectors, the reach is broad enough to rewrite the regulatory landscape much as the USA Patriot Act did in the wake of 9/11. Privacy may well be another of the casualties of this war. The Executive Order adds that “[a]gencies shall consider the assessments and recommendations of the report in implementing privacy and civil liberties protections for agency activities,” but asks for little more than an annual report. In contrast, corporate reporting is singled out. “Information submitted voluntarily in accordance with 6 U.S.C. 133 by private entities under this order shall be protected from disclosure to the fullest extent permitted by law.” This has been the case with the Patriot Act and the President’s policies give little comfort. Confidentiality, rather than privacy, is part of the new regime. Paul Rosenzweig, writing the Lawfare blog from Brookings highlights the importance of the short-list: a subset of critical infrastructure organizations within the identified industry which make up the heart of each industry and will be singled out for heightened cybersecurity engagement. Confidential Identification – The EO has one true innovation in it – a confidential naming program that will identify the critical cyber infrastructure “where a cybersecurity incident could reasonably result in catastrophic regional or national effects on public health or safety, economic security, or national security.” This is a subset, of course, of the earlier broader definition. Being an identified company may bring greater security obligations or improved resources or no change at all. Only time will tell. The impact will vary tremendously depending of the existing preparedness of each company. The National Intelligence Estimate on cybersecurity risk makes clear that the threat must be addressed. The report, which represents the consensus view of the U.S. intelligence community, describes a wide range of sectors that have been the focus of hacking over the past five years, including energy, finance, information technology, aerospace and automotives, according to the individuals familiar with the report, who spoke on the condition of anonymity about the classified document. The only question is the cost of the response. China, Russia, Iran, Israel, North Korea and other countries are known for releasing global cyber-attacks, some focused on military and political topics, while others highlight corporate espionage. Moreover, as I mentioned in an earlier post, the intruders use directed attacks on employees and independent contractors who open links, photos or already infected USB devices. Already behind firewalls, these tools install malignant code to glean passwords, open files and glean information which is sent back to the intruder. Some of these attacks are directly at U.S. infrastructure, others at economic targets, while many others affect U.S. interests only as collateral damage to regional conflicts which do not involve U.S. participants. Nonetheless, the risks are increasing. After the President’s speech one thing is clear. Using the State of the Union as the basis for the announcement of the Cybersecurity Executive Order and Policy Directive has placed this topic near the top of the national agenda. While the Communications Sector is one of the 18 Sectors identified as part of the critical infrastructure, the focus is on the telecommunications network rather than the content itself. Nonetheless, the continuing attack which lasted over four months raises serious questions regarding the ability of organizations to effectively defend themselves against a serious professional attack. The nature of the exposure has also changed. Instead of attacks targeted at firewalls, the campaign is not conducted through phishing – bogus links in innocuous emails that open the firewall to allow installation of “remote access tools” — or RATs. Those tools can siphon off oceans of data — passwords, keystrokes, screen images, documents and, in some cases, recordings from computers’ microphones and Web cameras — and send the information back to the attackers’ Web servers. To meet this threat the Department of Homeland Security established the Office of Infrastructure Protection in 2002. It has its hands full. This is a complex mission. Critical infrastructure ranges from the nation’s electric power, food and drinking water to its national monuments, telecommunications and transportation systems, chemical facilities, and much more. The vast majority of critical infrastructure in the United States is privately owned and operated; thus, public-private partnerships are essential to protect and boost the resilience of critical infrastructure and respond to events. The attacks are real. The Washington Post has reported on an overseas attacks which target utilities, including one which gained control of a Texas water utility. Uncounted numbers of industrial control computers, the systems that automate such things as water plants and power grids, were linked in, and in some cases they were wide open to exploitation by even moderately talented hackers. … From October to April, the DHS received 120 incident reports, about the same as for all of 2011. But no one knows how often breaches have occurred or how serious they have been. Companies are under no obligation to report such intrusions to authorities. Congress flirted with new legislation to update the obligation of companies in the 18 sectors which provide our critical infrastructure but it was ultimately unable to agree on legislative action. In its place, President Obama is expected to issue an executive order which will highlight the obligation to respond to a notice of imminent threat or to update the capacity to respond to a cyber-attack by any organization within one of the sectors which receives a governmental notice. A possible draft of the order is available here. While business is reluctant to embrace these new obligations, the acknowledgment by the New York Times of the vulnerability companies face should change the dialogue about the executive order and the need to plan for cyber-defense rather than complain about its costs. After all, the cost of inaction will be much, much higher.